How many times over the years have I thought, come New Year’s Eve, that I really must lose weight and get fit? One great way to do so is, of course, to walk more. 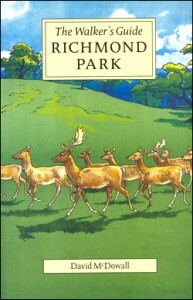 Both my husband and I are rather plumper than we would wish due to the many hours daily that we spend sitting at our PCs, so, having pondered what to do about this pre Christmas, I bought him a stocking-filler book called The Walker’s Guide: Richmond Park. The park – some 2,500 acres of enclosed space according to this guide – is but a mile away from our home and offers many walks on footpaths between the 12 or so gates that surround it and link it with local neighbourhoods. Many local residents enjoy the park’s countryside feel – indeed people travel quite a distance to enjoy the rural landscape with uninterrupted views to St Paul’s Cathedral. Runners, cyclists, dog owners, walkers and, in better weather, families armed with picnics and kites all make use of this wonderful resource. Having been diagnosed with Lyme disease some five years ago, and knowing that the park residents – deer, rabbits, foxes, hedgehogs and other small mammals, and birds – can act as carriers for ticks, I haven’t walked through its long grass and bracken-lined paths for a long time now. The guide’s pretty front-cover drawing of deer got me thinking anew about ticks. When this guidebook was last revised and re-published, in 2006 – just after the time when my first Lyme disease symptoms became evident – there were apparently some 750 deer resident in the park, and goodness only knows how many small mammals. I wonder how many there are now, in 2013, and how many of those who use the park for recreational purposes are aware of the potential dangers that lurk in the long grass? I’m not going to let it put me off walking there, but I will most definitely follow the guidelines of tucking my long trousers into my socks and using DEET-based insect repellent, plus the obligatory post-walk checks, and will try to stick to the well-trodden footpaths rather than heading “off piste”, so to speak, into the long grass. I also intend to contact the author of this interesting guidebook, David McDowall, to ask him to include information on Lyme disease and ticks in any future such publications. I note he has also written on Windsor Great Park and Hampstead Heath, two other potential Lyme disease reservoirs frequented by many people who know nothing about the health problems that a bite from an infected tick can cause. Here’s to walking more in 2013, and living healthier lives generally, while carefully avoiding the potential for acquiring the dreadful infection that is Lyme disease!